Tickets for our November 8th Rumor’s Comedy fundraiser must be purchased from the office by October 24th. Call 204-586-2236 to make arrangements. 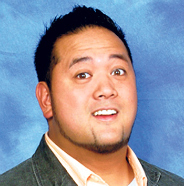 It promises to be a great night with comic Ron Josol! Ron Josol is a professional stand-up comedian who regularly performs across the globe. In 2000, Ron won the Craven A’s funniest home grown competition for the Just For Laughs comedy festival and has since appeared on “Comedy Now”, CTV/Comedy network, the “Winnipeg Comedy Festival, “The Orange County Comedy Festival”, and his own comedic specials. Indubitably, the most recognizable Asian comedian in Canada, Ron was profiled in CBC Bill Cameron’s short documentary “Different but the Same”. Currently, he writes and performs on the Much Music hit show “Video on Trial”.